Ceramic Clay Prints are baby hand prints and footprints captured in kiln-fired Ceramic Clay. These stunning hand-crafted Keepsakes make the perfect Baby Gift or memento. Specialist techniques are used to take the baby hand prints and footprints in soft ceramic clay, which is then shaped and engraved before being painted, glazed and fired. Ceramic Clay Prints are high quality Baby Keepsakes that will be cherished forever. Each Clay Baby Print can be painted in a variety of colours and will be antiqued to highlight the unique lines and detail of your baby's hands and feet. 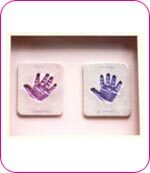 Unlike the many air-drying clay imprint kits on the market, which will deteriorate and diminish over time, a glaze-fired Ceramic Hand Print and Footprint provides a permanent, everlasting memento of your baby's early life and those special day's gone by.